The Worcester Bosch Greenstar Heatslave II 12/18 kW combi oil boiler is a popular choice in UK homes as it offers heat and instant hot water directly from your boiler rather than from a water storage tank. You'll save space and also benefit from mains pressure water flow to you shower and taps. 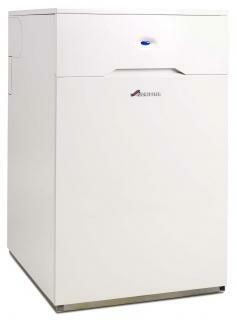 A combi boiler is often cheaper to install as there is no storage tanks and less pipework required. Greenstar Heatslave oil combi boilers are floor standing appliances which can be installed in the kitchen. Other features of this range are that the products are robust, they come with an optional fascia mounted programmer and they are compatible with an optional plug-in time clock. With a SEDBUK 2009 efficiency rating of 91% the Greenstar Heatslave II 12/18 kW is a very efficient oil boiler and is extremely quiet when in operation making it a great choice if you require an internal boiler. Measuring 85.5x52x60cm the Heatslave II combi will fit between most kitchen units and features easy access installer connections for rapid servicing and maintenance. The Worcester Bosch Greenstar Heatslave II is compatible with a solar thermal system and has several options available for your heating controls including the latest wireless and remote control technology. This particular boiler has a central heating output of 12-18kW with a domestic hot water flow rate of 15 litres per minute at 35 degree temperature rise. Efficiency is at 89.4 per cent. This boiler is recommended by the Energy Saving Trust. If you're looking for something similar, but with a bit more oomph, check out the Greenstar Heatslave 18/25, or the Greenstar Heatslave 25/32 - you won't be disappointed with either one of them.